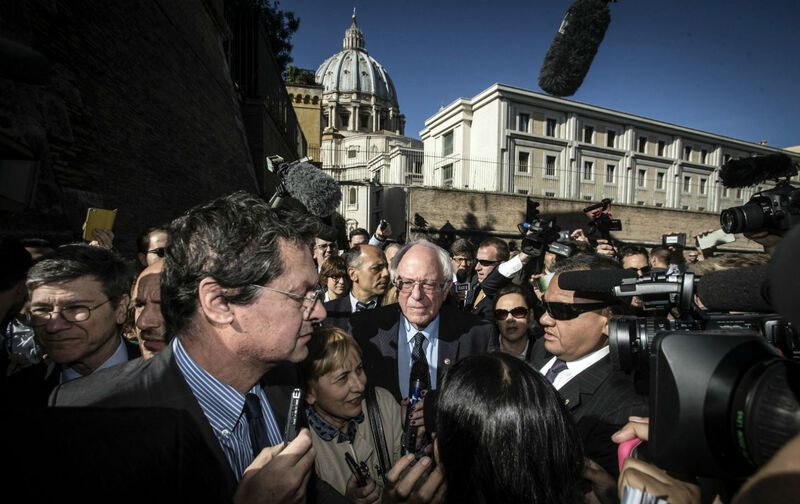 Sanders’s hope for a moral economy is amplified at the Vatican. Senator Bernie Sanders’s overnight trip to the Vatican last week was parsed mostly as a campaign tactic—whether this was a wise use of time with the New York primary approaching. Sanders’s supporters relished the contrast with Hillary Clinton. While the Vermont senator went to the Vatican and met with Pope Francis, Clinton traveled to California for two fundraisers with George Clooney, including a Friday night soiree asking a startling $353,400 contribution per couple to make it to the head table with Clinton. For the most part, however, the substance got lost. Sanders went to the Vatican to speak at a small gathering of world figures convened by the prestigious Pontifical Academy of Social Sciences to commemorate the 25th anniversary of Centesimus Annus, the encyclical released by Pope John Paul II soon after the breakup of the Soviet Union. He used the occasion to provide a moral grounding for his political appeal. In his remarks, Sanders located Centesimus Annus in a line of papal teaching that can be traced back to the dawn of the Industrial Age, with Pope Leo XIII’s encyclical, Rerum Novarum, issued in 1891 and forward to Francis’s stirring Laudato Si’, issued last year.